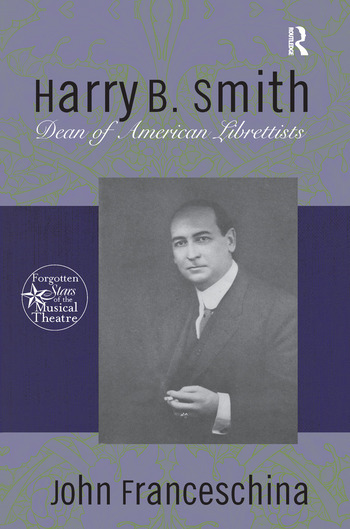 Harry B. Smith was the most prolific writer of librettos for the American musical theatre in history, with nearly half of his 300 works actually opening in New York City. In addition, Smith was instrumental in adapting and popularizing foreign musicals in America, significantly influencing writing and composing styles of American shows. He worked with every major composer in America between 1880 and 1920, and consequently this examination of his work and process is highly instructive of the history of the American musical. John Franceschina is professor of theatre history at the Pennsylvania State University. He is the author of Sisters of Gore, Gore on Stage, Homosexualities in the English Theatre from Lyly to Wilde, Duke Ellington's Music for the Theatre, a three-volume translation of the Plays of the Marquis de Sade, and David Braham: The American Offenbach.